Madrid can rightfully boast of its abundance of regional and international cuisines. But in the heart of Spain’s capital is a one-of-a-kind eatery that should not be missed. 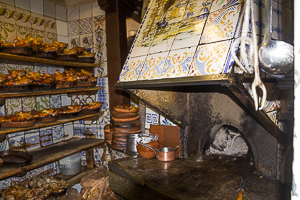 Sobrino de Botin is the oldest working restaurant in the world, according to the Guinness Book of Records. 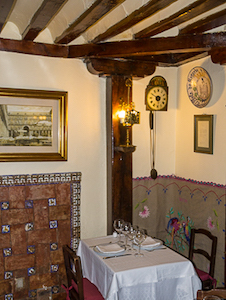 Founded by a French chef in 1725, Botin is now owned by Antonio Gonzalez and his family. Every day, they serve their world-famous roast suckling pig and roast lamb to tourists, celebrities, royalty, and regulars alike. When my husband and I dined at Botin, we chose to share three dishes: Iberian ham as a starter, a salad, and the roast baby lamb. Along with some crusty bread and a jug of sangria, it was a filling meal that had our palates doing a happy dance. The ham originated from carefully selected black Iberian pigs that are fed a diet of acorns, whose oil ensures juiciness and distinct flavor. The ham is cured for three years. It bore no resemblance to any I’d ever tasted. Thinly sliced, lean, and slightly chewy, it had a mild flavor that seemed to gradually grow in intensity with each delectable bite. The salad platter provided a canvas for the artful array of greens, ham, hard-cooked eggs, cheese, beets, and artichokes that looked as delectable as they tasted. The tastes and textures combined to make the dish even more flavorful than its parts. I could have stopped at the salad, but it seemed disrespectful to come to Botin and not try one of the specialties of the house. The lamb was juicy and lightly seasoned so the subtle smokiness imparted by the original wood oven could take center stage. The juices made for a sauce that complemented the meat, and took it to an even higher level. The crisp-tender potatoes drizzled with a little of the sauce made the perfect accompaniment for the meat. 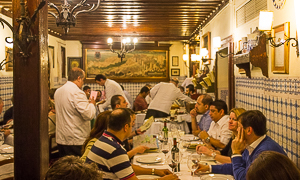 Botin has hosted numerous celebrity patrons over the years, including several generations of Spain’s Royal Family and author Ernest Hemingway, who proclaimed Botin to be the best restaurant in the world. The upstairs dining area was immortalized in a scene on the second-to-last page of his novel The Sun Also Rises. Summing up our entire experience perfectly, Antonio stated, “Botin is something special. You can feel it when you walk in the door. I think we have something magic here.” We couldn’t help but agree. Our bill came to 80 euros (about $88). It was a splurge to be sure, but well worth it.